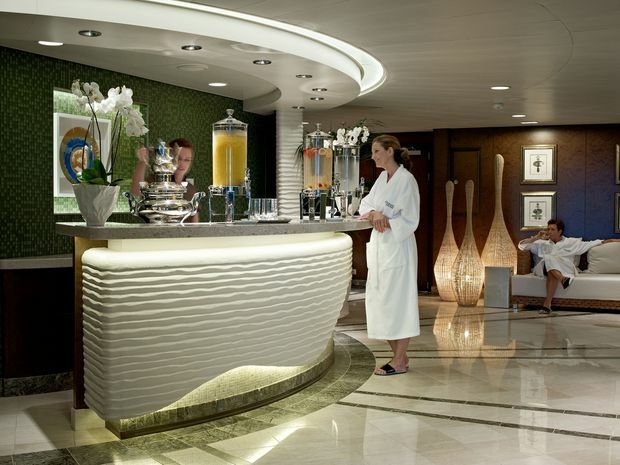 The Class Canyon Ranch Spa Club on board the Seabourn Ovation. I am not the ideal candidate for an ultraluxury cruise. Partly, I’m too easy to please. Put me on a ship, sit me down on a comfortable chair, point me at the waves and I’ll be happy. If the ship can take me to a place I’ve never been to before and save me the hassle of repacking suitcases and waiting for trains on crowded platforms, I’m sold. Partly, too, I’m too hard to please. My personal idea of “luxury” is extremely specific. On my ideal cruise, the restaurants would all be meat-free, Tillamook chocolate milk would pour from every faucet and the Velvet Underground would play a nightly show. But then, we are all particular. If people are basically alike in their fundamental needs, they are radically different in their wildest fantasies. What this means for the ultraluxury cruise segment is that the most successful experiences are the ones that can accommodate a wide range of definitions of “luxury,” rather than trying to shove a bunch of caviar down everyone’s throat. This is a principle that Seabourn understands well, and which it has put into glorious practice on its newest ship, the Ovation. If you’re into fancy wine and flashy flatware, they’ve got you covered in the ridiculously elegant main dining room. If you prefer your elegance turned down half a notch – from tie to open-neck – head to the Grill by Thomas Keller, which serves lobster thermidor and New York strip steak. Another turn of the dial brings you to Earth & Ocean, a pool-side tapas grill where the waiters wear matching Chuck Taylors and bring you goodies such as octopus plancha à la grecque, homemade tapenade and fresh-baked flatbreads. While you can choose from five restaurants, you only get one room. So there, Seabourn strives for please-all extravagance: light marble countertops, dark wood panelling, impossibly soft beds. Even standard-sized rooms feel huge – not at all like they’ve been miniaturized to fit onto a ship. The patio seats four. The bathroom, with two sinks and a full-sized tub, is bigger than what I’ve got at home. 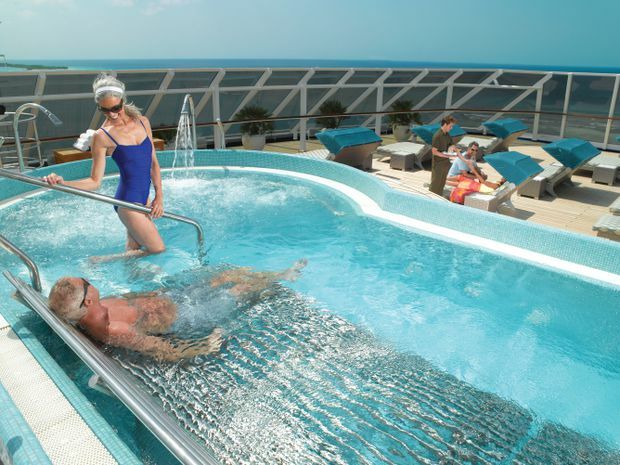 The Retreat, perched on the ship’s highest deck, consists of large tents around a small pool. Each tent is like your cabin – with a couch and a TV – except they also come with free Champagne, unlimited caviar and an onsite masseuse. In the unlikely event that you become bored with your room, you can always escape to “The Retreat.” Perched on the ship’s highest deck, it consists of a constellation of large tents centred around a small pool. Each tent is like your cabin – with a couch and a TV – except they also come with free Champagne, unlimited caviar and an onsite masseuse. Personally, I’ve never developed a taste for salt-cured roe and I couldn’t tell a $15 bottle of cava from an 1841 Veuve Clicquot. At the top of my priority list is coffee – and the Ovation delivered on that front. As a confirmed obsessive, being able to order as many cappuccinos as I want from dusk to dawn is already incredible. But when those cappuccinos are made from exotic beans roasted daily in the ship’s own facility, I’m well into fantasy territory. Then there’s the gelato. Made daily in delicious and always-changing flavours such as kiwi, raspberry and (yes) coffee, it rivals anything you’ll find on shore, even when docked in Italy. As a vegetarian gourmand, I like my sushi. The Ovation has an entire restaurant for this, which I visited every day. Greeted by name by the Japanese-speaking staff, I would order my bento box. The cucumber was crisp and the avocado fresh. To keep the green-tea ice cream from melting too quickly, it was served in a thick, ice-cold glass dish. 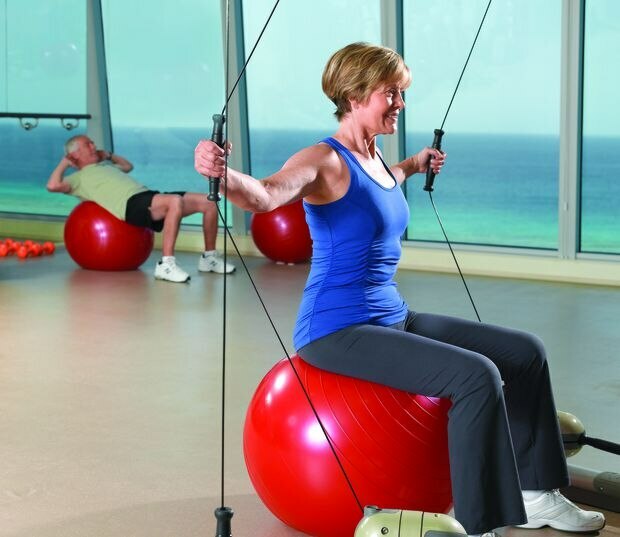 For those who enjoy workouts along with their luxury experience, there's an ocean view to keep you from getting bored. Perhaps the best example of the Ovation’s extreme attention to detail is those humblest of things: books. Every cruise ship library I’ve ever seen was stacked with the same tired selection of bestsellers and obvious classics. Browsing the shelves on the Ovation, I felt like I’d been transported to my favourite independent bookstore, with hot-off-the-press titles from small publishers sitting next to inspired off-the-wall picks. I spent most afternoons and evenings on a plush, oversized deck chair in a private spot overlooking the busier parts of the ship. As the people below me swam, ordered drinks, headed off to dinner in fancy dress, I was tucked away. I read my books, drank my coffees and people watched – just as some clever ship’s designer had somehow foreseen I would. The writer travelled as a guest of Seabourn Cruise Line. It did not review or approve this article.